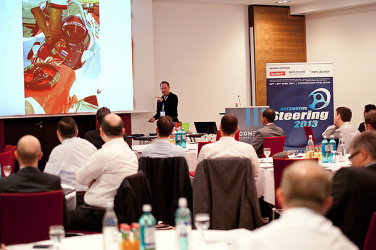 On April 23rd, 2013, PersonaGrip's inventor, Ed Dellis -- "The Steering Wheel Guy" -- presented Paradigm Shifting the Steering Wheels in Racing to a group of steering engineers gathered at the Automotive Steering Conference held in Berlin, Germany. Engineer/Inventor/Racer, Dellis, explained his 26 years of paradigm-shifting development from both an engineering and human perspective. His talk covered everything from the hunt for the right thermoplastic formula -- for ideal stick-slip characteristics -- to improved signal-to-noise ratios made possible by the grips as they incorporate more slow-twitch muscle fibers in the human proprioceptors used to detect steering feel. Dellis conducted a Racing Workshop where attendees molded a steering wheel. 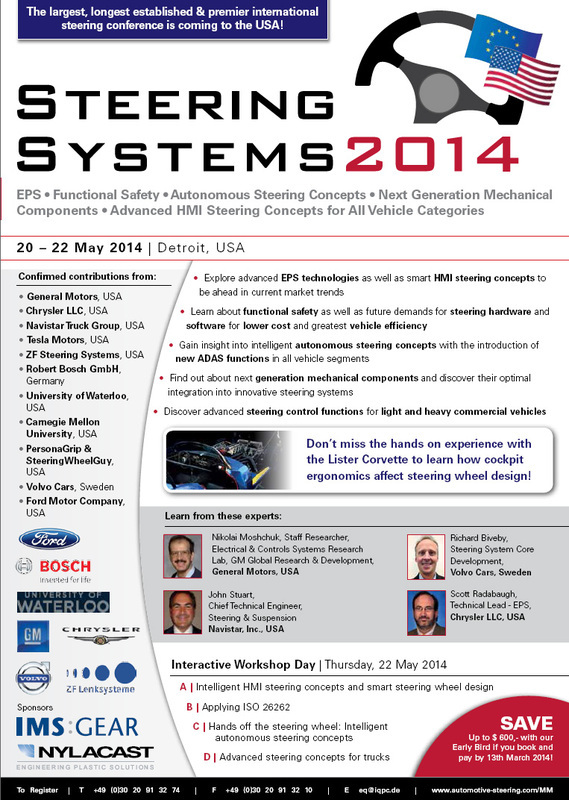 On May 21st, 2014, Ed Dellis presented his paradigm-shifting technology at the 8th Annual Steering Systems Conference in Detroit. Three days later on the 24th, he conducted a special Racing Workshop where attendees witnessed how a custom-molded steering wheel is made. They held a steering wheel and felt the composite thermoplastic mold in their hands. Dellis' Lister Corvette was on hand so attendees got to see how cockpit ergonomics affects steering wheel grip design. Today, a properly molded custom-molded steering wheel grip involves the whole cockpit. As the top teams from around the world have discovered, designing effective custom-molded steering wheel grips properly isn't as easy as it looks.